Does life have you down? Do you ever feel like hitting your head on a wall repeatedly while screaming “why me?” Are you looking for a new way to brighten up your car or pint-sized cubicle that you call an office? 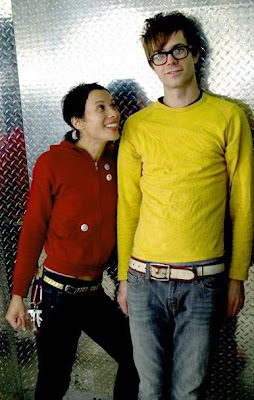 I have just the thing for you…Matt & Kim. My little brother J introduced me to these guys in the car the other day on our way to a family party. While I did not express much interest in them at the time—could have been because I was a little bit more concerned with the skills of the driver than the music on the radio, sorry J—I did end up buying their latest CD and became an instant fan. I had heard their song Daylight previously, but wasn’t too familiar with the band or their music overall so I thought I would give their latest album a shot. Definitely worth it! If you are looking for polished and pretty then you better look elsewhere. Their sound is a little rough around the edges, but that is what gives it that great authentically creative vibe. If I had to compare them to another band I would say that they are a much happier, sunnier version of the White Stripes. Like the stripes, the “group” consists of a girl (drummer) and boy (keyboards/vocals), they have a distinctly “indie” sound, their execution is not always cookie cutter perfect, and their songs will be stuck in your head for days. In my opinion the best thing about Matt and Kim is how upbeat their music is, AND their ability to avoid the use of profanity in any of their lyrics making them a genuinely creative band.